G 21. John le Rous of Hanslope taken with three wool fells stolen at Cosgrove in the hundred of Cleyley, comes, and being asked how he wishes to acquit himself thereof, denies the theft, all felony and whatever is against the peace etc. And for good and ill he puts himself therefore on the country, for which the sheriff of Northampton is ordered to cause to come here twelve etc. of the aforesaid hundred, by whom etc. And the jurors of the aforesaid hundred come and say that the aforesaid John is guilty of the aforesaid theft. Therefore let him be hanged etc. His chattels 18 d. for which the town of Northampton answer etc. 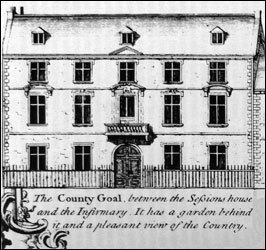 The County Goal [Northampton] between the Sessions house and the Infirmary. It has a garden behind it and a pleasant view of the County. The Quarter Sessions were court sittings held in January (Epiphany), April (Easter), July (Thomas a Becket) and October (Michaelmas). The charges heard mostly concerned felony, poaching, keeping disorderly alehouses, wages owed, removal appeals, bad treatment of apprentices by their masters, rates disputes, blocking waterways, and failure of parishes to keep roads and bridges in good order. The Courts also set rates for wages and carriage; details are found in the Record Books, Order Books, Minute Books and the Court Rolls in Northamptonshire Record Office. Records relating to Cosgrove & Old Stratford have been extracted from Kay Collins's indexing work for the period 1686 -1834. The appeal of the inhabitants of Cosgrove, co. Northampton, against the removal order of William Seabrooke, his wife and family from Castle Thorpe, dated 7th July last, upon examination of John Franklyn and the non-appearance of officers of Castle Thorpe to support the order, is allowed and removal order is discharged. Before E. H. Watts, Esq., and Spencer R. Harrison Esq. Edward Smith, of Cosgrove, was summoned by his master, Joseph Evans Whiting, Castlethorpe. For stealing three pints of milk, on 3rd of December. The charge was proved by George Whiting and of prosecutor. Prisoner pleaded guilty and was committed to the House of Correction for one month.